With the glorious sunshine it was an opportune time to get some of Swim to bike work done ahead of the racing season. For a lot of local triathletes Kilkee Hell of the west triathlon is the holy grail of racing, for others the season is only starting to get started. 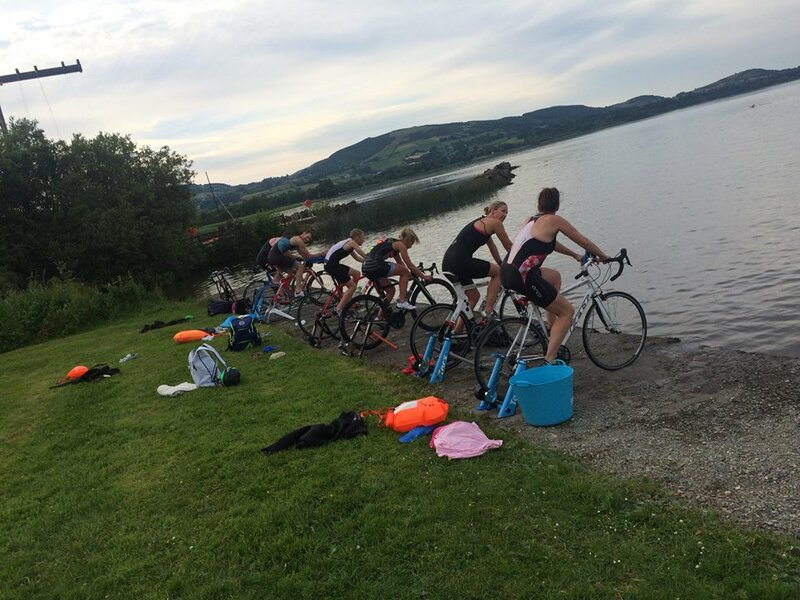 Swim to bike work is brilliant for all levels as the turbo helps to keep most people together and we were lucky to set ours up on the lake side. Swim to bike work is the least worked of the “TRANSITIONS” in triathlon but with a few cat 1 and potential cat 1 athletes in our group is a highly important area to train. Even for our non elite age groupers and fun racers that join in, learning to cope with elevated hrs on the run from the swim, the funny feelings of the first few mins on the bike etc etc is important. The rest of the nights swimming was done without the wetsuits ala skins. 2 laps and 1 lap efforts followed by 5 mins each time on the turbos.